For 125 years, members of Northern Light Eastern Maine Medical Center Auxiliary have proudly fulfilled the role of ambassadors and advocates for our patients’ and communities’ needs. And, they’ve done this by hosting and participating in several social, philanthropic, and service events. You’ll often see them at our Children’s Miracle Network Hospitals Telethon and Golf Tournament, playing and volunteering. 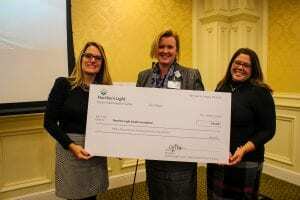 This year, through their Children’s Endowment Fund, they generously donated more than $15,000 to Northern Light Eastern Maine Medical Center Children’s Miracle Network Hospitals to help us fulfill our mission to make sure Maine kids have access to the very best healthcare, close to home.